Posted on Thu, Jan 12, 2012 : 5:58 a.m.
HookLogic is leasing the 11,000-square-foot former Leopold Brothers brewery space for its expansion. Pictured: software development manager Matt Frech; chief product officer Jonn Behrman, vice president Rob Streeter; and general manager Gary Evans. HookLogic, a New York-based technology company whose software helps retailers and digital marketers influence online customers, signed a deal to lease the 11,000-square-foot former Leopold Brothers brewery on South Main Street in downtown Ann Arbor. The deal, which comes four months after the company secured $9.5 million in venture capital, provides a bigger space for HookLogic to grow its local operation. The company, which had about 30 employees as recently as September, plans to consolidate its two downtown offices into the new space at 523 S. Main St., which will be renovated. HookLogic had been leasing 5,000 square feet of space at its offices at 111 W. Kingsley and 603 W. Huron. HookLogic is in the midst of a hiring surge. The company said it September that it would add about 35 employees within months, and "many" of those have already been hired, general manager Gary Evans said in an email without providing specifics. "We will be adding many new positions in A2 in 2012, and into the future, as we continue to build out our core teams," Evans said. Colliers International real estate brokers Jim Chaconas and Brendan Cavender represented both sides in the lease, including majority owner John Schmelzle of Schmelzle & Associates Inc. in Rogers, Az. "It took us a long time" to find the right place for HookLogic, Cavender said. "We finally decided this was going to be the coolest spot in town. We've got plans to redo the entire interior of the place, the exterior, make it a very high-end contemporary office. They're going to take the whole building." As recently as late 2009, the building owners were considering marketing the space for use as a banquet and large meeting facility. "We knew that we wanted a space that was going to be downtown and we wanted a place that was going to create energy and be an exciting place to work," Evans said in an interview, calling the Leopold Brothers brewery a "gorgeous old building." He added: "We wanted something that was going to stand out a little bit. There's a lot of smart people in Ann Arbor and we wanted to build a place that was going to create some attention while energizing the people who work here." Evans said HookLogic would establish a collaborative work environment with room to grow. "We tend to build offices with a lot of open space," he said. "We don't use a lot of cubes, we don't have a lot of private offices, we like to keep people together where thoughts and ideas can be easily traded." The expansion is possible because of the company's popular e-commerce software, which helps web retail clients like Expedia.com and media agencies target customers with customized marketing messages. "As online purchasing becomes ever more mainstream, the opportunities to influence the behavior of online shoppers expand accordingly," Evans said in an email. HookLogic began expanding its Ann Arbor-based product management team when the company in 2009 hired Jonn Behrman, a founder of an Ann Arbor-based Internet marketing firm called Beyond Interactive, which was sold in 2000. 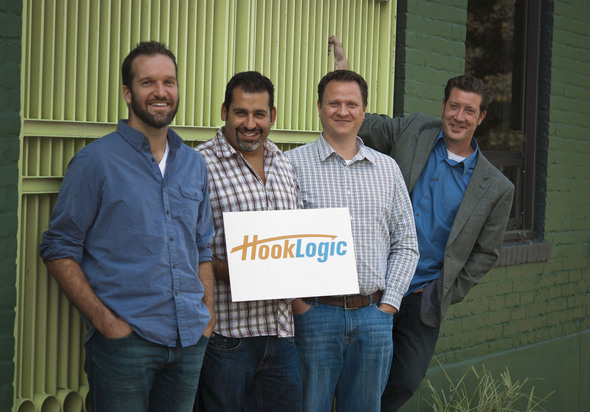 In 2010, HookLogic located its automotive solutions division at its Ann Arbor office, fueling local growth. The company is hiring software developers, product managers, sales people and analysts. The company's connections to Ann Arbor can be traced to several employees with local roots, including CEO Jonathan Opdyke, who graduated from U-M in the late 1990s. Opdyke co-founded HookLogic with COO Vardaan Vasisht and CTO Kevin Hermida. All three worked at Beyond Interactive with Behrman. Sat, Jan 14, 2012 : 8:38 p.m. The name TechBrewery is already taken in Ann Arbor, but I think HookLogic should call this place the TechDistillery. Fri, Jan 13, 2012 : 2:19 a.m. I suppose another tech firm will add more jobs than a brewery. Still, I mourn the brewery. Thu, Jan 12, 2012 : 5:42 p.m.
Thu, Jan 12, 2012 : 3:29 p.m.
Good for them--a bit boring for the rest of us. Thu, Jan 12, 2012 : 2:32 p.m. Sat, Jan 14, 2012 : 2:39 a.m.
Concur with Ron Granger 100%. To nab the kind of employees a company like this needs to succeed, a location central to *the fun things to do* cannot be overvalued. Thu, Jan 12, 2012 : 4:41 p.m. I really wouldn't want to work in those other locatons you mention. Not At All. State and Ike? Yuck! Packard and Carptenter? Double Yuck! Plymouth... It depends, but most of it nasty stripmall. People might be surprised at how much location matters, and merely being in Ann Arbor isn't enough. A central location like Leopolds is walkable and bikable from many parts of A2. Those other spots you mentioned, not so much. Thu, Jan 12, 2012 : 1:43 p.m. I had always hoped another brewery would open in it's place, but am just happy to see the lights go back on. Leopold's was one of my favorite places in Ann Arbor, I am excited to see something breathe new life into it. It is a beautiful building. I agree. I love this building and was hoping to go back in there someday for a drink!